How many of you are panicking as the first signs of holidays are here? As soon as Halloween is out of the way, we’re all about Thanksgiving and Christmas, and as long as we haven’t turned every single member of our close and distant relatives into vegan advocates, there is some anxiety associated with holiday meal preps, dinners, and family gatherings. I know some of you will choose vegan turkey alternatives, but others would really like to have their guests and family feel the tradition, without feeling deprived, and yet it being cruelty-free. Well, I have a recipe for you that will do the job! 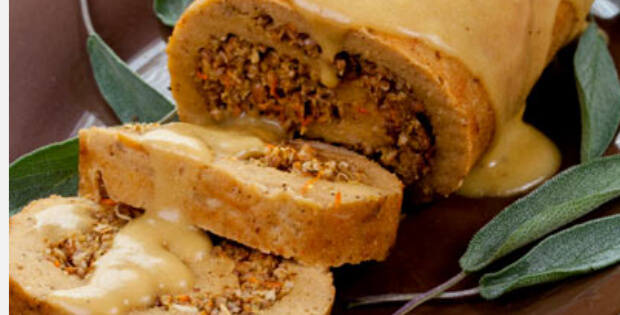 It’s an amazing Seitan Turkey Roast with a stuffing so rich and satisfying you’ll make your guests forget all about meat altogether… It’s also topped with an absolutely delish, melts-in-your-mouth low fat brown gravy sauce you could just eat with a spoon ! In a medium sized mixing bowl, mix together all of the ingredients for the stuffing and set aside. In another medium mixing bowl, mix together the dry ingredients for the sietan. Place the wet ingredients into a blender or food processor and blend together until smooth. Pour in with the dry ingredients and kneed it together until well combined. Place on a 12″ X 20″ heavy duty aluminum foil sheet, sprayed with canola oil or spread on with your hands. Roll the seitan out into a 9″ X 7″ rectangle. Pour the stuffing over the seitan and spread it evenly, pat it down to make it stick. Roll it into a roll by starting on the longest end and rolling gently and tightly as possible with your hands inward. With your hands rub a small amount (a little less than a teaspoon) of oil all over the outside of the roll and then sprinkle it with paprika. Last, wrap the aluminum around the roll, sealing the ends. Place into the oven, on the middle rack, without a pan, folded sides facing up. Bake for 90 minutes. Remove from oven and slice the middle and make sure it’s done through and through. If it’s not, cook another 10 to 15 minutes or until done. After it’s out of the oven, let rest for 10 minutes before cutting.